Protest against separation of immigrant families in Oshkosh, WI | Fight Back! Oshkosh, WI - Members of the Oshkosh community gathered June 14 to protest the separation of immigrant families and the detainment of children. The protest was in response to the recent actions by the Trump administration of separating all children from their family at the U.S.-Mexico border. Over 2000 children have already been ripped away from their families since the operation began. Organized by United Action Oshkosh (UAO), the protest was held at the Oshkosh Sun Dial, where participants could be heard close to Senator Ron Johnson’s office. Senator Johnson has stated in the past that he supports an increase in border security while opposing amnesty for undocumented people. Governor Scott Walker has also ordered nearly two dozen National Guard troops to the U.S.-Mexican border. 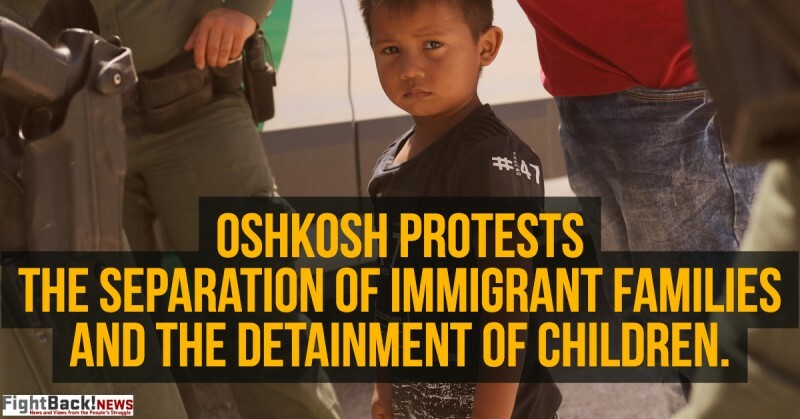 This misuse of state resources is a despicable addition to the cruel policy of family separation in the U.S.
United Action Oshkosh continues to focus on its current campaign on making Oshkosh a sanctuary city, along with the creation of an Oshkosh Police Accountability Council (OPAC). With this addition, the sanctuary city resolution would be a strong step towards police accountability and support for the marginalized communities within Oshkosh. UAO will hold its next sanctuary city workshop for the public in July.